For a proposal in Jasin , Melaka, we combined Honeycomb terrace houses, cluster townhouses and semi-detached houses that varied in price from RM150,000 to RM350,000. 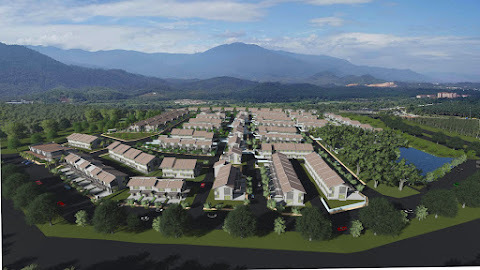 The client is one of the Government owned companies that has been given the job of building affordable housing in Malaysia. Although it has been in existence for over a decade, the National Housing Corporation, SPNB Berhad, had more recently changed its guiding policy. Instead of building a fixed ratio of low-cost, low-medium and medium-cost houses at fixed prices funded by proceeds from sales supplemented by grants from the government, now the affordability range has been stretched to wider range, the ratio of low-end to higher-end houses has been made more flexible, and the corporation henceforth must be more self-sustaining. Working with SPNB Bhd to help the government implement affordable housing, the State Government of Melaka made available a 20 acre site in Jasin, Melaka. 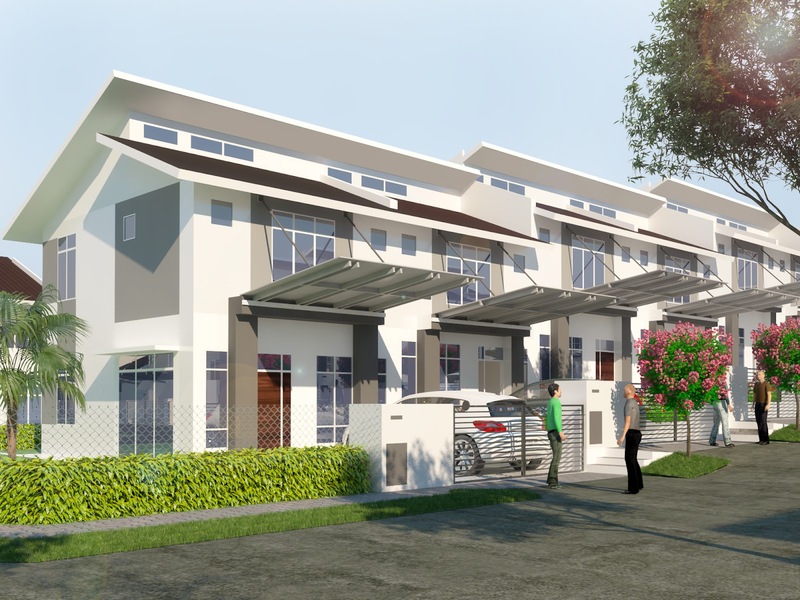 The land comprised a small hill that had been planted with oil palm, opposite a technical school and overlooking a low-cost terrace housing estate and a short row of detached houses. The hill with the peak in the centre and sloping down all around it posed a challenge. The aim was to try to minimize the earth cutting. To achieve that we set the levels from the lowest points in the neighbouring land and designed the roads from them at the steepest slope that is allowed, which is 1:12. The terrace houses, which had 6m frontage, were raised 500mm at every unit interval to achieve the maximum allowable slope. 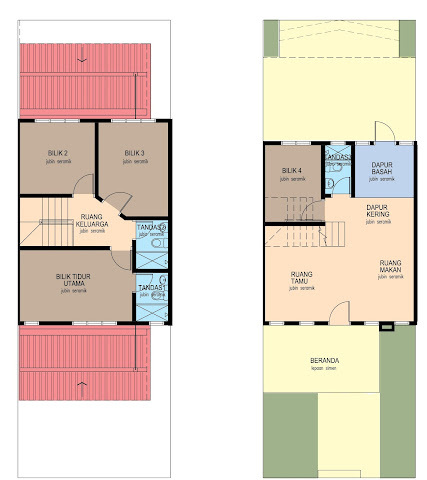 The client was keen to test new ideas to match their new affordable housing policy; the idea of a new housing estate with a broader mix of house-types was in line with their new mandate. 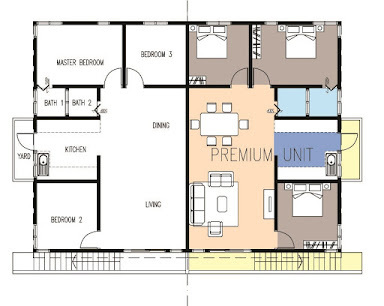 They were also keen to design housing with better social features compared to conventional forms. For these reasons that we were able to get this job, and to be able to apply the Honeycomb terrace ideas. The terrace houses were laid out to in the middle of the site, with steep cul-de-sac roads starting from the lowest points on Eastern boundary up to the middle of the site where the central spine of terrace houses is located. Here at the spine, the terrace houses face one direction then the other, with cul-de-sac roads on both sides. Drains on this site either go eastwards towards a retention pond at the lowest point in the east, or else it flows west towards the neighbourhood green open space on the west which has another smaller retention pond. Around the terrace houses are blocks of townhouses and semi-detached houses. 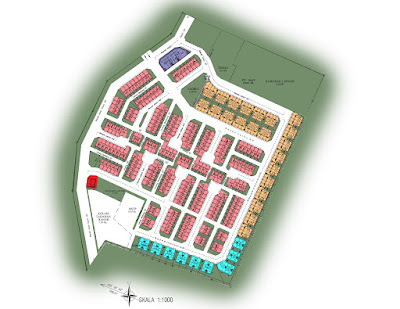 In this layout we could place communal courtyards in front of the houses. The Melaka State planners insisted that any open space smaller than 10,000sf would not count towards the 10% green requirement. On top of this, the State Public Works Department (JKR) also required the road around that green to be a 40’ road. However, we believed that if we could minimize traffic in front of the houses, shift the resident car parks to the rear and have the front-yards fully utilized as gardens, the cul-de-sac road could still function as an attractive social space. 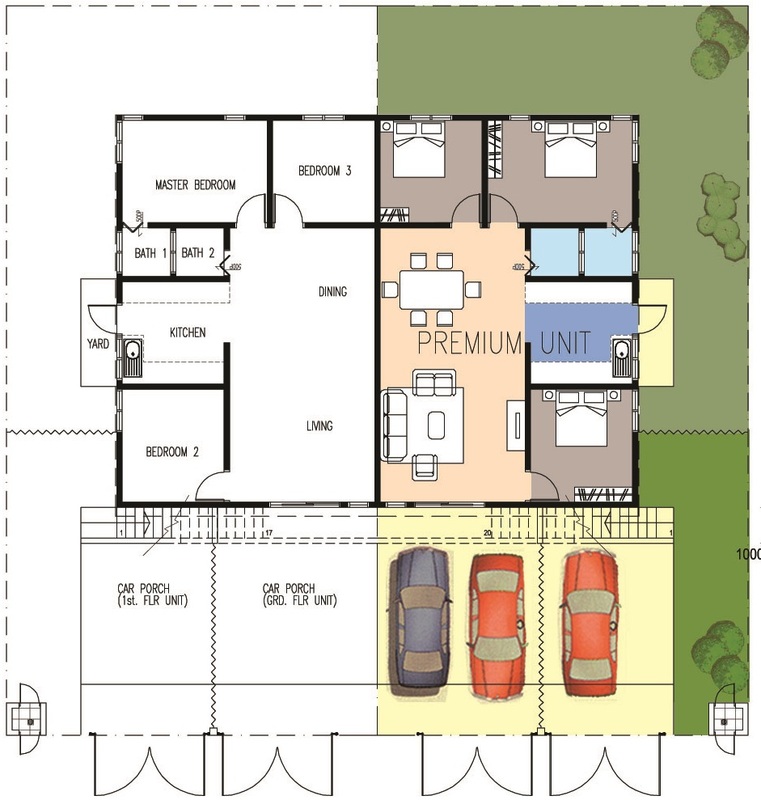 We submitted the plans with two car parks for each unit at the rear and using the back-lanes to access them. 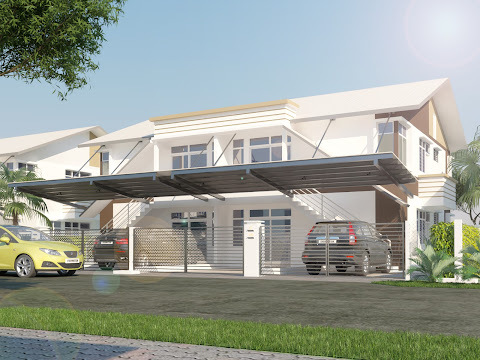 However, the idea of having the resident’s carparks at the rear of the houses proved to be too radical an idea for the Melaka State Planning. So we had to shift back the car parks to the front. Not ideal, but it was the best we could get. The site had the old estate manager’s bungalow on the hill-top in the middle of it. This house had to be demolished and the land cut down. There was no way to avoid earth cutting and export because the levels at the periphery of the site were fixed by the existing levels and retaining walls would have been expensive. However, we could minimize the volume of cut earth by making the roads as steep as could be permitted, which was a 1:12 slope. To achieve the 1:12 slope, the terrace houses were designed to step 500mm every 6m. This meant a step at the boundaries of each intermediate terrace house. 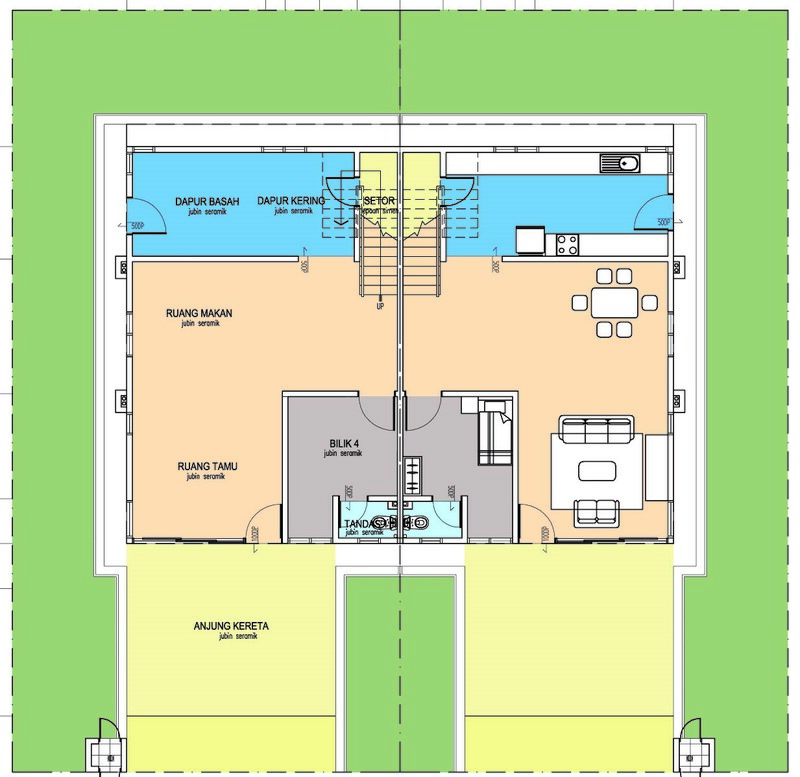 However, on the first floor, steps were introduced only every two units, such that the ceiling height of one unit would be 3.1m,but its neighbour at a lower level would have a ceiling height of 3.6m. In this way, the construction cost associated with additional beams on the first floor and roof levels were avoided. 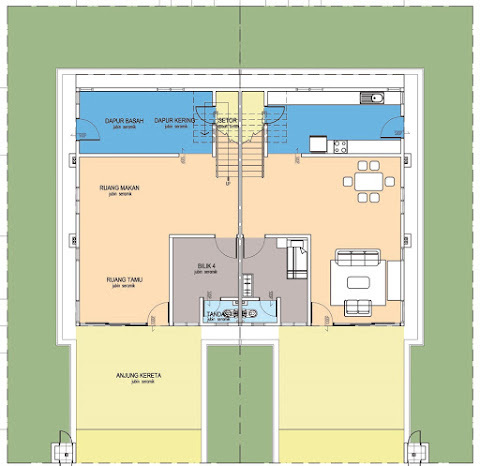 At the same time, this additional cost of additional beams and extra walls on the ground floor could be recovered by selling the unit with the high ceiling at a premium. 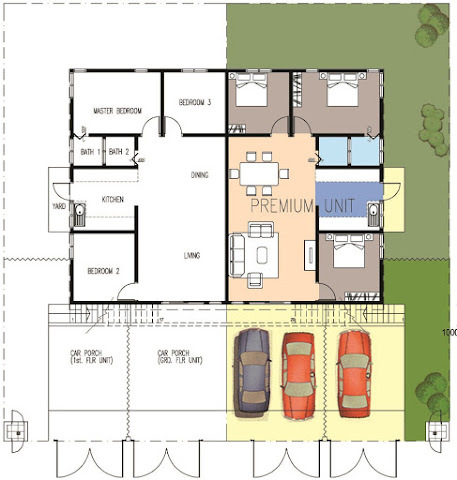 The townhouses have 1000sf built-up area each with a car porch for two cars side by side. Unlike the townhouses at Alor Gajah, there are four of these units in each semi-detached block. 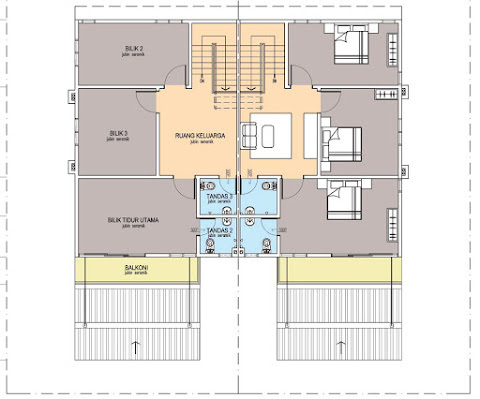 The internal layout has a living area opening to two bedrooms at the side, a dining and dry kitchen area that opens up to a wet kitchen at the side and the master bedroom suite at the back. Placed on the border of the site, the master bedrooms have vistas overlooking the houses below them. 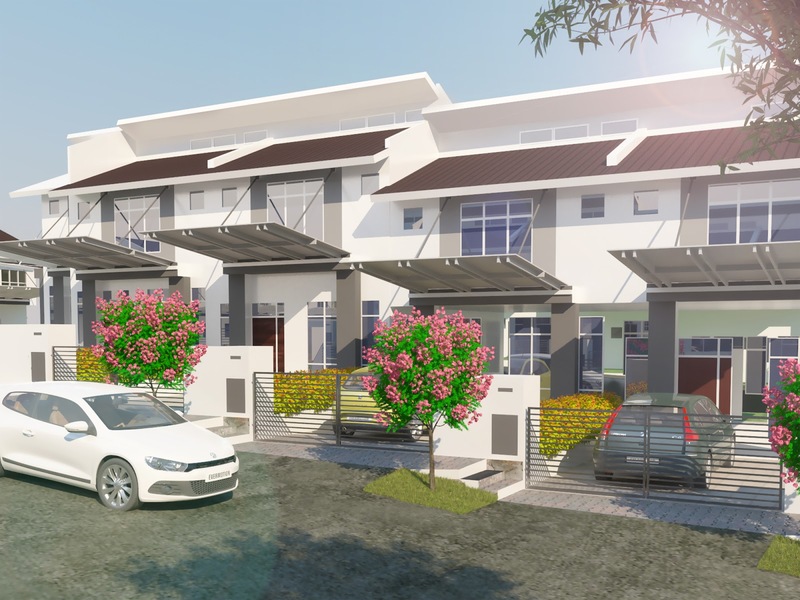 The townhouses are priced from RM150,000; the lower floor units which have larger garden areas than the upper floor ones are priced slightly more. 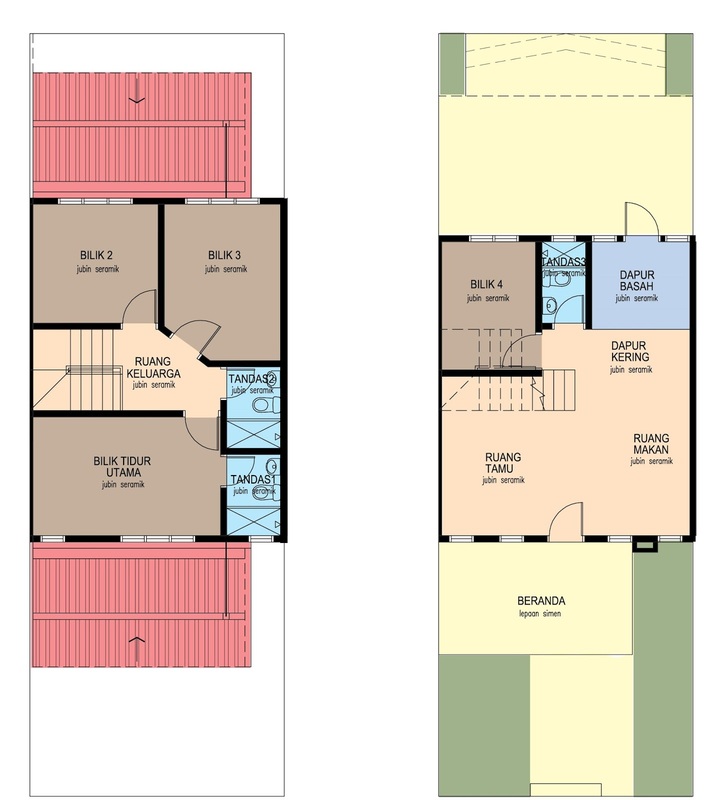 Each terrace house has a column-free car porch for two cars, a wide living and dining area in the front and a kitchen, toilet and bathroom at the back. 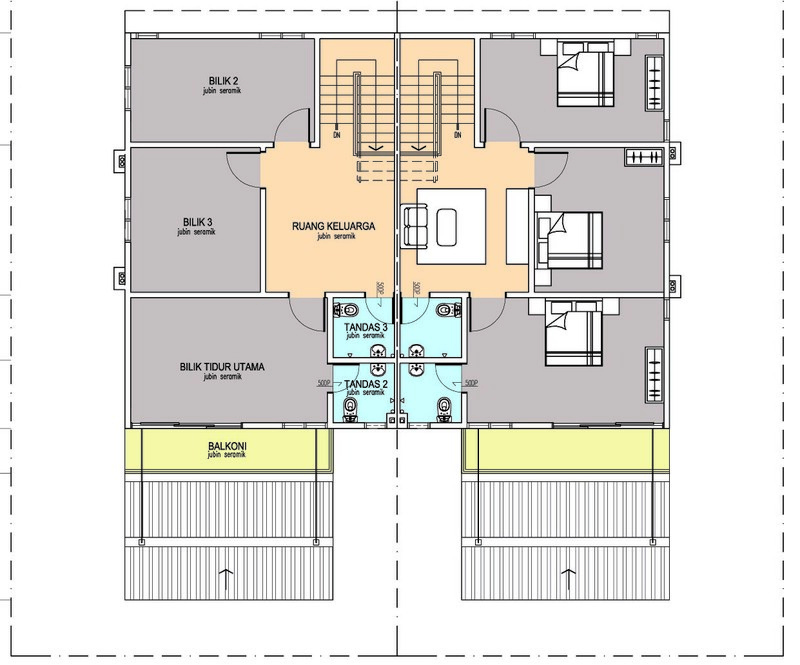 The staircase in the middle leads up to two bedrooms and a shared bathroom and a master bedroom with an ensuite bathroom. Initially, the car porch was to be at the rear but as required by the State Planning authorities, we had to place them in front. The garden area is now shifted to the rear, each intermediate unit garden 16’ x 20’ serviced by a 20’ back lane. 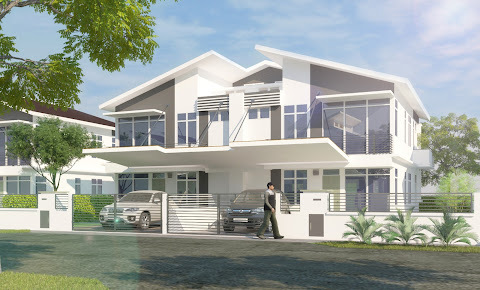 The terrace houses are priced from RM240,000. 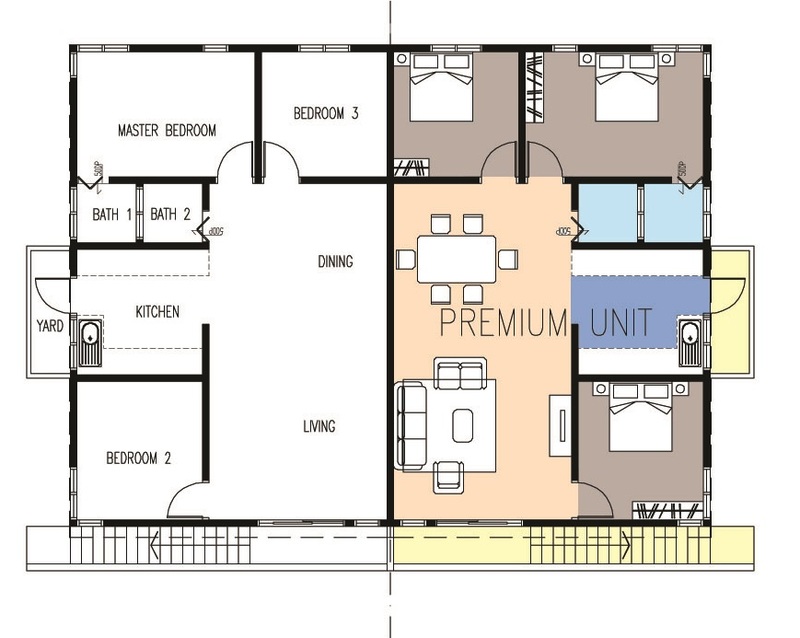 Due to the layout design, about half of the units are premium lots being either corner lots with land at the side or units with taller ground floor ceilings or both. Apart from the Townhouses and Terrace houses are a small number of semi-detached houses priced from RM320,000 and single-storey shop-houses. This mix in the types of houses is expected to make it easier for the developer to sell and deliver the products. As I’m writing this, the first phase of the construction work is underway with the completion slated for 2018.